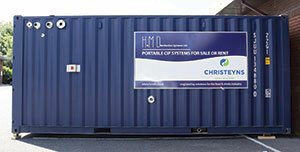 Christeyns Food Hygiene, based in Warrington, has partnered with H&M Disinfection Systems to launch a new, bespoke containerised CIP system for optimising cleaning equipment in the food and dairy industry. Container In Place is a bespoke, containerised Cleaning in Place (CIP) system which comes fully loaded and self-contained, ready to be connected directly to existing pipework, tanks and associated equipment, providing an immediate and cost-effective upgrade to cleaning requirements. In many plants CIP equipment can be old and those responsible for its specification, installation and setting of parameters may no longer be with the business. In addition, modifications to the CIP set may have taken place over time, changing the original operating parameters or flow dynamics, which can affect the efficacy of a clean. Emerging food safety challenges in recent years, such as allergen management and species control, may have also placed additional burdens on the equipment. Modernising or replacing a CIP set itself requires capital expenditure which may be difficult to secure. There is also the challenge of being able to assign a sufficient break in a production schedule to actually replace pumps, tanks, heat exchangers and control equipment. This new Container in Place system is completely self-contained with its own heating system and as it only requires a water and power source it can be flexibly situated. The system also provides full PLC control, CIP printed reports and remote access. The full system fits inside a standard 20 foot shipping container and can be built to order in around three months. The Container in Place not only frees up factory space but also allows a CIP system to grow as business grows, without any interruption in production. It also acts as a back-up system during breakdowns or maintenance. Providing flexible solutions for cleaning and sanitising, tailored to individual needs is what Christeyns Food Hygiene does best. With around 30 years of experience, it is one of the UK’s most trusted providers of industrial hygiene solutions, working across the food, beverage, brewing, dairy and pharmaceutical industries. This entry was posted in News and tagged Food Safety. Bookmark the permalink.